Red carpet, paparazzi, fancy people, luxurious yachts lined up in the marina… and the festival hasn’t even started yet. In fact this is just your regular, every day, Cannes. I think the locals must feel towards us exactly like the locals in Amsterdam towards their particular thrill seekers: every May, people come here to get high on films and stars come to get high on public adoration and limelight. They get used to us, the film tourists, the junkies coming to their quiet, posh little Riviera town. “The badge people” come here to find the perfect trip. It could be described as a polar night: from the dark of the movie theaters we jump directly into the late night parties for which Cannes is so famous, squeeze in the occasional scouting for stars in the dim light of hotels lobbies. We love films and for two weeks, we live for films. But they, the people who call Cannes home, what do they love and live for? Can’t really say, our worlds never mix, we’re the parasites. 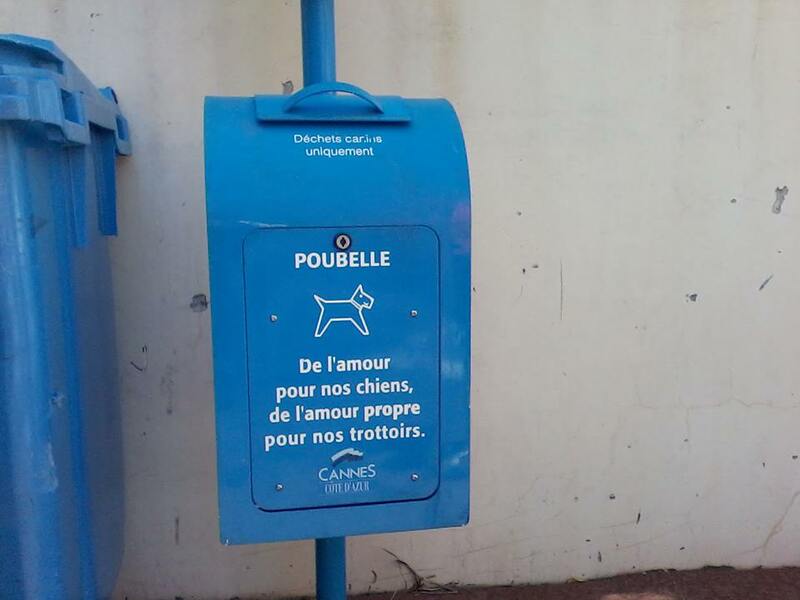 I can only translate the inscription on the metal stand where you can get poop bags for your dog (funny enough, the stand is called Poubelle): “from the love for our dogs, from the love for our sidewalks”.